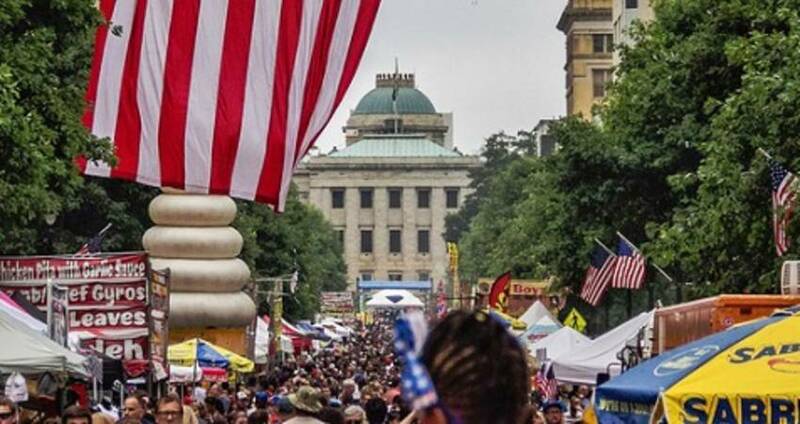 Wear your red, white and blue and head to downtown Raleigh, N.C., for The &apos;Works! festival on July Fourth. Here are five reasons not to miss the popular Independence Day celebration attracting visitors and locals alike. From noon until 10pm, The &apos;Works! is a free, all-day festival for the entire family. Get there early as parking decks will fill up quickly. Helpful hint: Here&apos;s a link to a map with parking decks! The GoRaleigh park and ride is also available from 6-11pm at two Raleigh locations. Think you have what it takes to eat your weight in hot dogs? Test your luck at the Tasty 8&apos;s hot dog eating contest! There will also be a Lumpy&apos;s Ice Cream eating contest and watermelon seed spitting contest. Participate in these food contests or watch from the sideline and cheer on the foodie daredevils. Sign up early if you wish to compete! Yes, you heard us. Watch as some of the cutest pups strut their red, white and blue this Independence Day. Plus, there will be a variety of unique events for the whole family during The &apos;Works such as a roller rink and King BMX stunt show. Get ready to dance the night away as you celebrate the Fourth of July! Free concerts will be happening throughout downtown Raleigh at Red Hat Amphitheater, the City Plaza Stage, Capitol Stage, Courthouse Steps Stage and the Beer Garden. See a full schedule of performances here—music kicks off at noon and runs until 10pm. For the grand finale at The &apos;Works, fireworks will light up the sky in two locations—over the Duke Energy Center for the Performing Arts (best viewed from anywhere on Fayetteville St.) and Red Hat Amphitheater. Check out even more July 4th events happening in the Raleigh area, here!